Okay, a confession here. Though I have a couple of other pieces by Mr. Kupperberg, as a general rule, I'm not a fan of his work. No offense to him should he stumble across this page; its simply a matter of personal taste. I've seen pages by him from 88-90 and 95 go by many times at low prices and waved them on their way; the two pages from him I have are from issues that I enjoy particularly or from scenes I really like for whatever reasons- I have them more for the characters/writing than for the art. However, there's one exception, and that's issue 49. This is a creepy Dr. 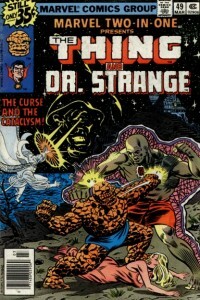 Strange team-up, and its really dark and evocative, one of the few issues where the art really makes the story for me. 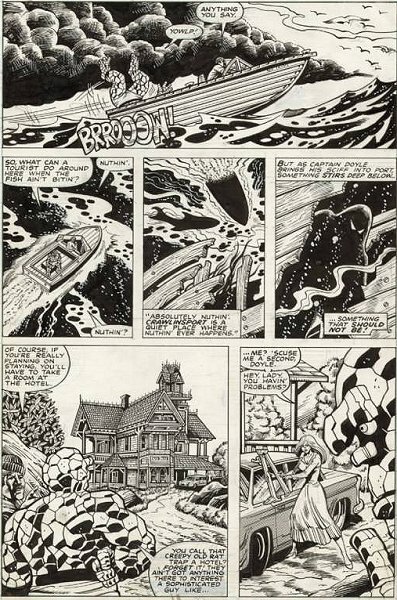 Just look at the beautifully eerie dark figure in panel 4, and the dark shadows making up the water and clouds in panels 1 through 3. I assume, as I usually don't buy into this artist, that this is due to Gene Day's inking; now that I check, his work comprises some of my favorite MTIO periods (he inked 49, 56-58, 61-67, 69-71). Anyway, great issue, beautiful piece, though it does lose a bit at full-size in my hands - I see more Kupperberg and less Day up close. Still, very happy to have this. This is an eBay purchase, made in April of 2010 (the art arrived in May). I have to confess this sale left a slightly sour taste in my mouth - it was listed as Day and not Kupperberg, which I originally assumed was an error on the seller's part (I knew it was Kupperberg, of course) until I received the art and saw Kupperberg's name physically written on it; apparently the dealer knew that Day would sell better and tried to pass it off that way. He's one of those guys who charges exorbitant shipping rates and then ships in a cheap envelope with no protective anything on it (to be fair, it was wrapped in one layer of plastic wrap, if you count that as protection). He took weeks to get around to shipping it, without communication. Just a bad seller; it doesn't seriously color my appreciation of the page, but still... sour taste.